Among the best spiced rums on the market, and winner of many top awards, Brinley Gold Shipwreck Spiced Rum is a four year old Guyanese molasses rum, aged in charred American oak barrels, expertly blended with real Madagascar Vanilla, Grenada Nutmeg, orange peel and clove. At their production facility on the island of Saint Kitts in the Eastern Caribbean, each small batch is infused for two weeks to extract maximum botanical flavors from the exotic ingredients, before being expertly blended by seasoned professionals. Aromas of creamy vanilla with nutmeg and orange rind lead to clove and mild honey. On the palate, the sensation of bold vanilla delivers a base of creamy smoothness for the nutmeg and clove, balanced by orange peel at mid-palate. The result is a best-in-class hand-crafted spiced rum that mixes perfectly with your favorite cola, ginger beer, fruit juices and citrus. 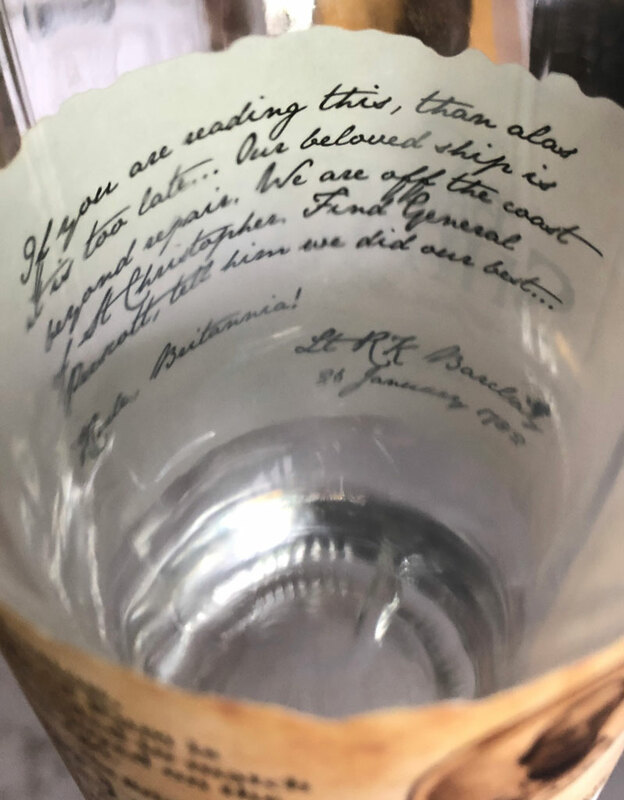 When you’ve finished the bottle, look for the hand-written message inside the label, dedicated to those aboard the British Troopship sank by the French Navy off the coast of St Kitts in 1782. Brinley Gold Shipwreck Spiced Rum has earned many prestigious medals and accommodations over the past decade, including the 2018 International Rum Expert Panel “Best In Class” gold medal in the spiced rum category, as well as a prestigious gold medal from the 2018 Consumer Rum Jury. Brinley Gold Shipwreck Spiced Rum is bottled at 36% abv. The 750ml bottle sells for about $25. On the west coast of Australia, the boutique family-run Kimberly Rum Company produces CaneFire No. 5 Aged Rum, a blend of two distinct marques. The first, dubbed Rohans’ Reserve, is a low cut high ester rum with a double run through the still, focusing heavily on character and deep flavor. The second, known as Annual Reserve, is triple distilled with few residual esters, resulting in a very light bodied zesty rum. The blend of these two styles of rum in just the right balance is the key to the consistency of CaneFire 5 Year Old Rum. Starting with raw, unrefined, first-quality Australian sugar, the process is started with a heat tolerant slow acting yeast that gently ferments over a long 40 day cycle. CaneFire 5 Year Old Rum is distilled in a custom built 1000 liter stainless steel Australian still. The distillate is then aged in oak from Australian wineries, including sherry and French oak ex-shiraz barrels, for at least five years. Aromas of cinnamon, baking spices and shortbread cookie over an earthy base are accented by a floral note, perhaps lavender. On the palate, the earthy mineral notes are balanced by spicy sassafras root and sweet nectar before a woody bitterness is revealed mid-palate for fine balance. Wood notes linger in the medium long finish. CaneFire 5 Year Old Rum from Australia is an un-dosed dry rum which suits the Australian palette with its deep rich character. It stands up to bold ingredients in rum cocktails, goes especially well with cola, and plays well in a tumbler on the rocks along with a garnish of fresh orange peel. Bottled at 40%, CaneFire No. 5 sells for $119 in Australia, equivalent to about $85 in the USA. Hidden in the midst of a cane field, on a road that’s far from any highway, an open-air boutique distillery is attracting the attention of rum enthusiasts with their classic plantation method of turning sugar cane into rum. Sugar Sand Distillery crushes their own cane, ferments the fresh juice daily and uses their wood-encased copper pot still to make small batches of rum — the same way it was done centuries ago. Sugar Sand Distillery features an open-air copper pot still hidden in the midst of a tall cane field. The result is a simple and delicious cane spirit. Some of the rum is maturing in small oak barrels to be bottled as golden aged rum. Way out on Henscratch Road, near the town of Lake Placid, Florida, we found Don Davies and Jessica Giffin (the Distillery Queen) busy hosting folks in their tasting room and overseeing the craft distillation equipment they use to make fresh rum. In the background, tall green sugar cane stalks are swaying in the gentle breeze of a former citrus grove, cleverly fed by a hydroponic system that delivers water and nutrients directly to the base of each plant. It’s a modern and efficient method for raising cane (pun intended) in the sandy soil of south central Florida, a by-product of Don’s decades of experience in the fertilizer industry. There’s plenty of enthusiasm in the tasting room, as visitors savor the rum made only 20 feet away in a still that looks like something borrowed from a Willy Wonka movie. It tastes like cane, with a bit of smoky flavor from the heavily charred oak barrels. The sense of discovering something new and unique is a delight to those that make the journey. Sugar Sand Rum from Lake Placid, Florida is a limited edition authentic boutique craft spirit. Distribution is a challenge, but they’re making steady progress throughout Florida. Sugar Sand Distillery also sells a moonshine and a vodka product made from cane. Almost everyone buys a bottle or three when they visit the distillery and that makes a big difference to the bottom line for this emerging production facility. It’s great to see small Florida distilleries like Sugar Sand popping up all over the sunshine state. It’s a movement that benefits consumers by having more and better choices for unique styles of rum to enjoy. Rum Enthusiasts are gearing up for the annual Rum Renaissance Caribbean Cruise through the Eastern Caribbean islands featuring VIP rum tours of iconic distilleries. This Caribbean Rum Cruise adventure sails from Fort Lauderdale on Monday, November 19 for 11 days, with an itinerary that includes Puerto Rico, St. Kitts, St Lucia, Grenada, Barbados and Antigua. Leading the VIP rum tours are veteran rum writers, collectors and hosts of the Rum Renaissance Festival Robert and Robin Burr. A modern cruise ship is the ideal resort for an Eastern Caribbean rum adventure. In addition to distillery tours, rum cruise passenger will visit Caribbean rum shops to peruse the myriad selection of rums of the Caribbean available for bargain prices. The 11 day Caribbean Rum Cruise begins and ends in Fort Lauderdale, Florida, celebrating Thanksgiving Day in Puerto Rico. For more information about the Rum Renaissance Caribbean Cruise, and to request space aboard the November 19-30, 2018 adventure, visit the Rum Renaissance Caribbean Cruise web site or call 954-778-5699. To stay abreast of rum news and updates, subscribe to Robs Rum Guide email newsletter.